You gain 5 points [?] Loyalty program points By purchasing products included in the loyalty program, you gain points, which then can be exchanged to other products available in the store or for a permanent discount. Only available to registered customers. 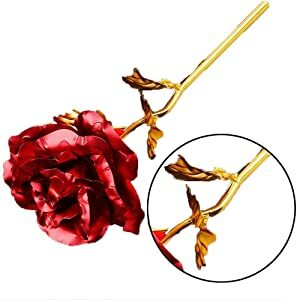 Red Rose Foil Flowers is a Best Gift for Valentine's Day, Mother's Day, Christmas, Birthday, Wedding. Impress with sweet lifelong memories of yourself, by presenting this JaipurCrafts stunning long lasting rose to your loved ones. Enhance the décor of any table with this elegant rose while showing your passion to someone so dear to you. Honor your wife, mother, sister or girlfriend. Salute your lawyer, principal, teacher, hostess or graduate. It is the perfect gift to express your love and gratitude. It expresses deepness of love like a rose but is allergy free. The entire rose including stem, petals and leaves is made from 24K gold to enhance the elegance. Features: The gold rose petals and leaves are 99.9% 24-karat gold foil, scape is gold-plated. Flower Size: 10 inches (25.5cm) approximately. It comes with Certificate. A red rose symbolises love, beauty and passion. 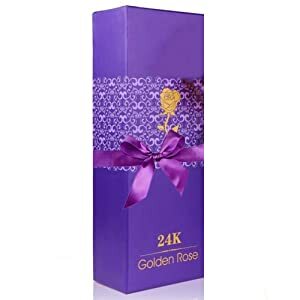 Gift your mother, sister, wife or girlfriend with this elegant and sophisticated 24-K golden rose from WebelKart to show your love, compassion and value for her on a special occasion. The entire rose including stem, petals and leaves is made from 24K gold to enhance the elegance. Enhance your home décor and preserve your moments of love with this beautiful rose which is a symbol of undying love and trust. 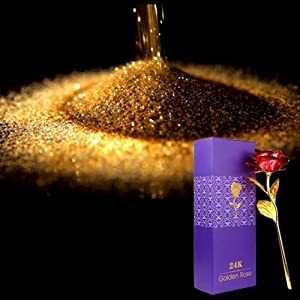 The leaf of the golden red rose has a genuine 24-K gold foil which enhances the look of the product and adds a touch of sophistication. WebelKart treasures the value of your loved ones. In order to ensure longevity, the rose is delicately packed to ensure security to the fragile item. It is presentable in a lovely gift box to enhance quality and gift giving. 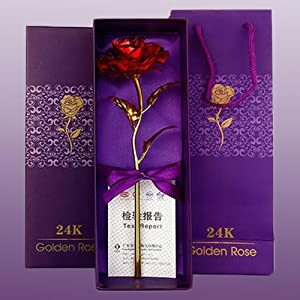 The 24K Red Gold Rose from WebelKart is an incredible gift option. Honour your wife, mother, sister or girlfriend with this elegant set of gold-plated roses and treasure the moment in the book of your life. The beautiful piece of a golden rose from WebelKart spruces up your home décor without burning a hole in your pocket. Place the roses anywhere in your house- living room, dining room or your bedroom and it will enhance the look of your room. The 24-K golden rose requires low-maintenance, thereby saving much of your precious time. 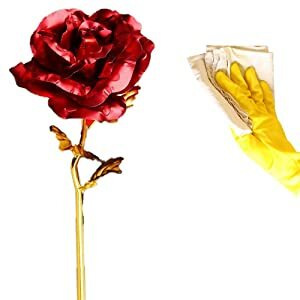 Just dust them regularly with a cotton cloth and your roses will last you a lifetime. The gold rose petals and leaves are made with 99.9 percent 24-karat gold foil, the scape is gold-plated, ensuring maximum durability. The golden roses will not be subject to corrosion. Allowing the beauty of the roses to remain intact for years. Indian handicrafts are known for their excellent design and appearance. Jaipurcrafts comes with a decade of experience flourishing a comprehensive collection of handicraft items. Fascinated by the urge to create innovative crafts, Jaipurcrafts brings to you an unparalleled range of antiques, paintings, handicrafts, wood carvings, furniture, and a rich range of handicrafts in glass, marble, sandstone and handmade paper. 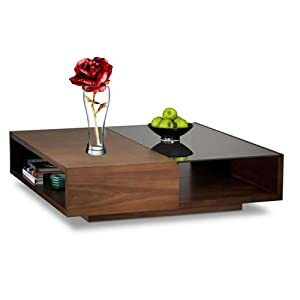 Handicraft items offered by our esteemed firm are beyond any comparison. To all of you, from all of us at Jaipurcrafts - Thank you and Happy buying!